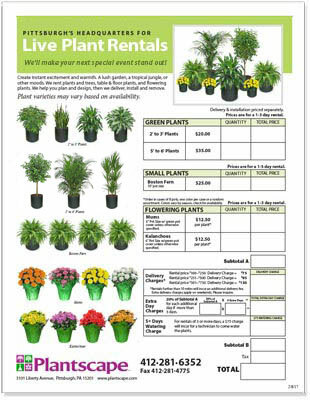 Plant Rentals for Your Special Event - Plantscape Inc.
Our short-term plant rental programs offer an easy way to add elegance, warmth, excitement, drama and beauty to your next special event. Theme parties, trade shows, corporate meetings, graduations, or other special occasions, we offer the choice of beautiful live or artificial plants. One day, two day, weekly or whatever schedule best suits your needs. We do it all for you--delivery, installation, removal & cleanup. 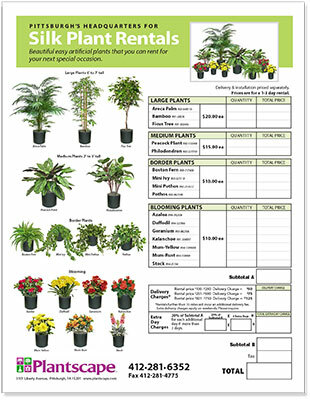 Click on one of the packages below to download PDFs containing information on plant selection, pricing and terms. Call 412-281-6352 for a quote or more information. We’re looking forward to helping with your next special event!